I'm a big fan of finding decorative ways to store everyday items. 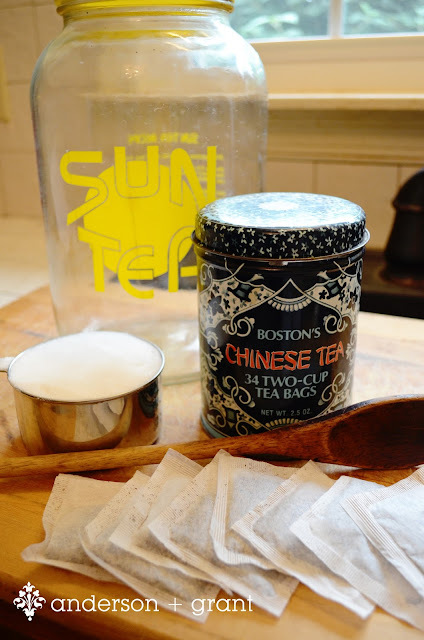 Last week, I shared with you my recipe for making sun tea, but I forgot to mention the storage idea for my tea bags that was in one of the pictures. 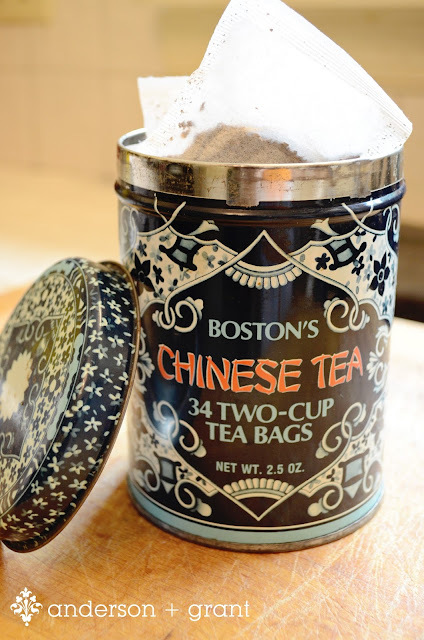 I use the vintage blue and black Chinese tea tin pictured above and fill it with tea bags. I take the tea bags out of the envelopes when I'm putting them in the can so that I can quickly make tea. By using the tea tin, I can have some tea bags be easily accessible without having to dig out the box every time I make tea. There are a lot of different vintage tins out there that can be used decoratively in the kitchen. Some of them I've seen have been for crackers, coffee, and baking powder. Not only are they functional, but they add a bit of a decorative element to your kitchen. If you have to store something, it might as well look nice! And vintage tins are something that will add a unique touch to your space....I love having something that not everyone has!